The Structure Activity Landscape Index (SALI) is a numerical approach to quantifying activity cliffs  and is described in Guha and Van Drie (2008a). The paper describes an approach to visualize the activity cliffs in a SAR dataset in the form of a network (or graph) termed the SALI network. The original approach was based on static images generated using Graphviz. This visualization tool allows one to interactively explore a SALI network at different cutoff values, allowing one to focus on more or less significant activity cliffs. In addition the application now generates SALI curves (Guha and Van Drie, (2008b)), which allows one to characterize the ability of a modeling protocol to capture the SAR landscape. It is a modified version of the ZGRViewer application that visualizes networks described in the DOT language. The application has been tested on OS X, Linux and Windows Vista, though it should work anywhere where Java runs and Graphviz has been installed. Update (07/24/09) - 2.0 uploaded which now supports loading structures from SD files. In such a case, the SD file must have a property representing the activity. Currently, Type 2 curves are not supported when reading from SD files. Update (09/27/08) - Fixed a bug where the SALI curve UI was not synced with the chemical data that may have been freshly loaded. This update makes sure that when new chemical data is loaded, the SALI curve UI is killed. Another result of this update is that the jar file is 15MB. This is because we now include the entire CDK library. This is done because the latest version does not properly display 2D depictions on OS X. After this is fixed we will provide a leaner update. Update (02/15/08) - Updated code to handle molecule names starting with a digit or names containing dashes. The input file format has been changed and the code updated to support it. No longer crashes if activity is missing. Edges corresponding to cliffs for which the similarity equals 1.0, have diamond shaped arrow heads. All other edge will have the normal triangular arrow head. Update (01/22/08) - The program will now highlight the difference in the two structures when an edge is clicked. Note that this seems to be buggy as the MCSS algorithm is sometimes behaving weirdly. Also, edges of the graph are now colored based on the magnitude of the activity cliff, at a given cutoff value. Black is the largest cliff and light grey is the smallest cliff. An example of the interface is here. There are three ways to visualize SALI networks. On the fly networks: In this approach all you need is the data file (format) which is used to generate the SALI matrix. The application utilizes the CDK hashed fingerprints to evaluate the SALI matrix and it should be noted that this fingerprint is not as discriminative as something like the BCI fingerprints. Once the SALI matrix has been generated you can explore the structure at various SALI cutoff levels on the fly. Pre-calculated networks: In this approach, you use an external program to generate the DOT file describing the network. One way would be to use the R functions to generate it. The resultant DOT file and a data file (format described here containing the molecule names, SMILES and activities can then be used to visualize the network. By definition this approach restricts you to looking at a single network - you cannot generate a new network with a different SALI cutoff value. You can get the v2.0 SALI viewer (based on ZGRViewer v0.8) from here and a few example SALI networks are provided below. You'll need to have Graphviz installed on your system for the viewer to work. You can also get the v2.0 tarball or zip of the sources. Untar the sources and then run ant sali to generate the SALI viewer jar file. The development version of the soure code is available from GitHub and is licensed under the LGPL. Start up the viewer (on Unix it should be java -jar sali.jar). You'll need to set some paths in the Preferences window the first time you run the program. In the popup window, double click on one of the columns representing the predicted values. At this point, these columns will be labeled as Value 1, Value 2 etc. You can try it using a PDGFR dataset. It contains two columns of "predicted" activities - the first such column is simply a jittered version of the actual activity values whereas the second such column consists of uniformly distributed random numbers. The fields are whitespace (tab or space) separated and lines starting with # are ignored. Names that start with a digit will have an underscore prepended and any dashes in names are replaced with an underscore. If you are using DOT files generated by another application make sure the node names match the molecule names in the data file. Note that though the terrm activity is used, the program assumes that smaller values of activity are better (i.e., more potent). This is the way one would view IC50's or Ki's. If your data is such that large numbers are more active, you should transform your data prior to using this program or else set the appropriate option in the settings window. The columns labeled pred1, pred2 and so on are optional. The should represent predicted values of the activities, for use in SALI curve generation. Note that the values do not necessarily have to represent predicted activities. In general they can be any set of predictions or ranks, that are expected to correlate with the observed activity. Input can also be provided in SD format. In this case, molecule titles are munged as described above. 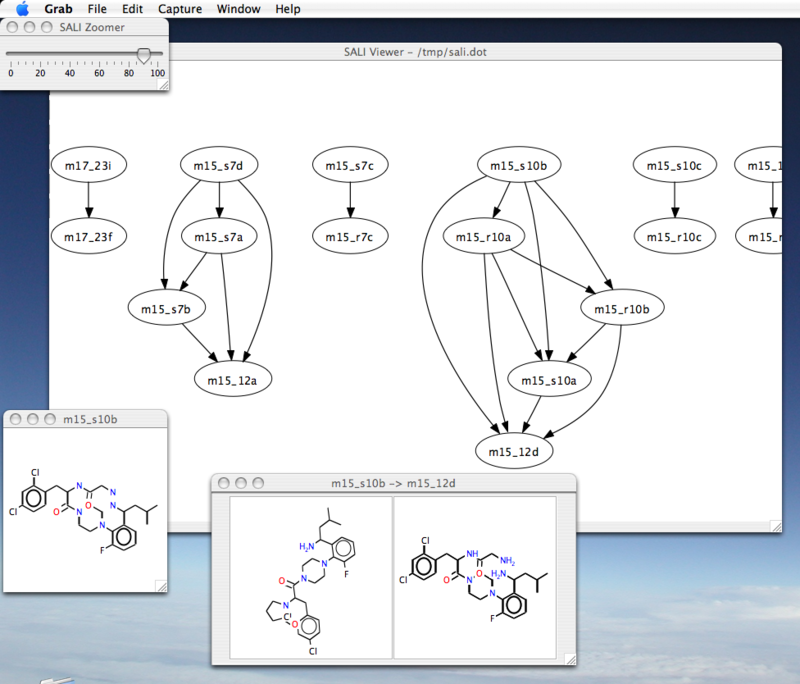 In addition the SD file must have at least one property representing the activity value for the molecule. If multiple properties exist in the file, you will have the option of choosing one.